With 25 like-minded people on a spiritual retreat in Sedona, Arizona, I came searching for inner peace and direction. Happily, I found a new tranquility for my soul, but not in the way I was expecting. The first day’s mission: locate the ideal spot for meditation. While hunting for someplace to plant our bodies, I did what I always do best – I took one for the team. Basking in the afternoon sun, a large rock called, but due to the recent rain, the river raged swollen and angry. Acting like Sacajawea, the female Indian guide for the Lewis and Clark expedition, I was sure there was a way to get to it safely. Then, I found it, or so I thought. Sauntering down the soggy embankment, with my not so nimble feet, my toe caught a branch, sending me hurling smack dab into the river. Horrified at my stupidity, I lay prone and motionless as freezing water stormed around me, mentally screaming every four-letter word I knew. Faking braveness to ease the crowd’s obvious concern at my awkward situation, I sat up and giggled, “You might want to find a different way.” Then, horrified, I looked at my naked finger. “Oh no! My mother’s wedding ring is gone!” I screamed hysterically. Frantically splashing to find it in the swiftly moving current, the memory of the day she placed her prized possession in my hand just before she passed away tortured my thoughts. How would I ever be able to live without it? “Are you OK?” Martin, one of the gentlemen in the group, inquired sympathetically as he lifted my drenched body out of the icy cold wetness. Nodding, I turned away so he wouldn’t see the tears now cresting in my eyes. Every time I wore that ring, I felt the most important woman in my life right by my side. Martin, now barefoot and precariously perched over the river on two boulders, was holding up the shiny piece of gold. “What a miracle!” I shrieked, draping my drenched body over his, clinging tight not able to contain my excitement. But little did I know the true blessing would come later. Climbing back, I was immediately surrounded by the warmth only love brings and all from a group of strangers. Finding ways to heat up my chilled body with blankets and articles of their clothing, they encircled me with not only physical but with spiritual protection, doing whatever they could to make my damp situation better. My needs became their needs. Later that afternoon, as I held my bitterly cold body under the hot shower, I began to sob uncontrollably. Sure, I was excited to have the ring back, but my explosion came from remembering something I sadly forgot: how lovely human kindness is. For so many months, this extrovert found herself unintentionally living the life of a recluse. With long days at the office, and the kids gone once again, I came home night after night to an empty home exhausted and curled up in my cave to lick the wounds of the day. Not wanting to bother friends and family with my problems and feelings of insecurity, being alone became my new normal. While I’ve always known compassion on a cerebral level is instilled in all, that day, as my life’s etch-o-sketch was gently shaken, erasing the loneliness I’d been hiding from the world, my heart began to soar with a new sense of belonging. When God created mankind, it was not His intention that we walk alone. We were given hands for a reason, to hold. 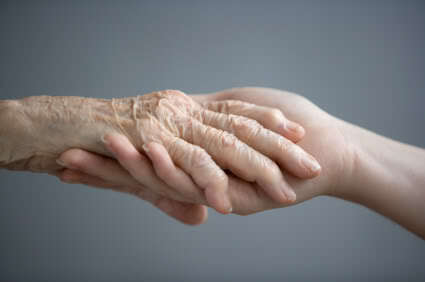 As our fingers become intertwined with another soul, a fabulous journey begins. Sometimes we walk their walk, other times they come with us. And, if we’re lucky, we’re just side-by-side sharing the same vision. But, no matter what, when we are connected we discover we’re part of the same tribe known as humanity. And, the best part of all? No piece of jewelry, including my mom’s hand, carved gold and emerald ring, will ever be needed to make those fingers shine.